Welcome to the Second Ripple, my small shrine to Mizuno Ami and her alter-ego Sailormercury or Bishoujo Senshi Sailormoon. Navigate with the dots to the left. So, this is my new layout, I made it on my new editing program. I like it, it's nice n' simple.... so yeah. I didn't really change anything else, so sorry, but I just don't have time!! Okay? Enjoy the site. Awards | Sign / View guestbook. 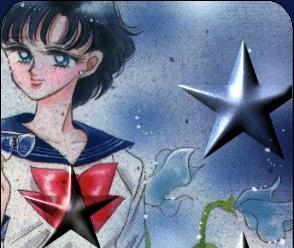 Bishoujo Senshi Sailor Moon and all related original charactors and places are copyright ©1992 Naoko Takeuchi. || This site is copyright ©1999 - 2001 Fringey.